Good: Story, Character development, Demonic Pokémon? The original Shin Megami Tensei series flowed in many different franchises, conquering the hearts of many, even with the often rather grim undertones of the games. 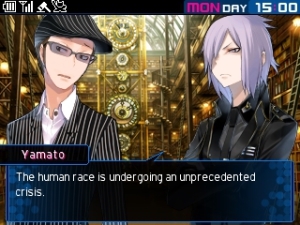 Devil Survivor is one of those other series that has always been well received and even though we’d love to see a third installment, we get a revved up edition of the second game for the Nintendo 3DS, with a decent amount of extra content. We were eager to get back to taming demons in order to save Japan, and possibly the rest of the world. 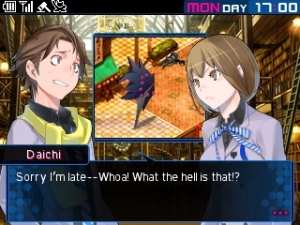 You are an unnamed character (which you’ll be able to name later) in Japan, when all of a sudden your classmate, Daichi Shijima, comes over showing you a weird snuff site, Nicaea, which, after you register, can supposedly inform you when your friends are about to get killed. Not only does it predict their demise, it will also show a very graphic video of how they will perish. Even though all of this sounds farfetched, you register wondering what will happen. As expected nothing out of the ordinary happens. After a hefty day at school, you and Daichi are waiting for the train home and while the drag of everyday’s life is no real bother, things are looking up when the cute Io Nitta comes over to talk with you. 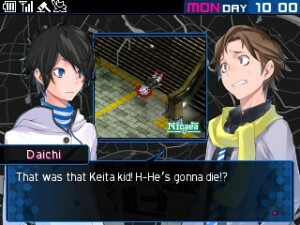 While you’re enjoying the conversation and Daichi is drooling all over her, something is amiss, as you suddenly receive an email from Nicaea, the site for the death prediction videos. It seems you are the lead star of the video, together with Daichi and Io, as you three die in it. Luckily you get presented with the choice to summon demons or die, and you decide to choose the first option. From here your journey as demon tamer begins, as you’ll have to subdue the demons that you have summoned, in order to guarantee your survival. Although the heinous situation at the train station felt like an earthquake at first, it’s soon clear something else is at play when the rest of Japan is in ruins as well. Things get even more confusing when a secret organization is thrown into the mix, presenting you with doubt on which side they truly are. The story value of Record Breaker is actually quite phenomenal, as you’ll be wading through short story sequences one after another, allowing you to choose your own path, to a certain extent that is. Most of the story itself is presented through visual novel-like sequences, which match the rest of the game perfectly. Most sequences are rather short, which is great as this is still a handheld title. Graphically Record Breaker is a mix of different styles that match perfectly. 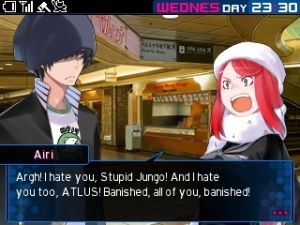 First of all there is the visual novel-like portion of the game that is used throughout the conversations that take place during your playthrough. As nearly half of the game are conversations and cutscenes it’s important that these sequences look good, and simply put, they do. The main characters are all quite detailed and look simply charming. Whilst the movements are quite limited, which is common with visual novels, the facial expressions are very graphic and well taken care of. Everything is supported by a detailed and colorful backdrop which, even though it might be static most of the time, does not take away the overall beauty of the entire picture. The only remark here is that side characters only have a very limited amount of ‘looks’ which causes the game to have a lot of copy-paste side characters. The combat animations have a Dungeon Travelers vibe to them, as you only see your enemy time, when engaged, and your characters will only pop up when it’s their turn (or if you wish to see their status). After that the animations are rather simple, with only your attacks and skills being shown on static enemies or your own lifebars, by animations that clearly depict what style of attack is being carried out. Other than that, the demons and characters still look as detailed as in the visual novel portion. Lastly, the view when you’re on the battlefield itself and not yet in combat, looks a bit dated compared to the rest. Whilst the overall visuals here are still rather cute, they look more like the original DS version, than what the 3DS is actually capable of. The graphical prowess of these scenes is reminiscent of the DS Pokémon games, which still works for a handheld game. That being said, the movements are fluent when walking around or when performing certain actions and there are sufficient details to keep things interesting, all supported by a rather bland color palette, which suits the grim setting. Even though the game is now on Nintendo’s 3DS, the 3D function is negligible as it will only show a few extra layers to some menu’s and pictures of demons, in a very faint way. It feels as if it was just implemented to use the functions of the 3DS in a very unnecessary manner, just to have it as an extra gimmick. Needless to say, this option was pretty much never used when playing through the game. It’s starting to become rather repetitive to say, but sound wise NIS America’s games do not disappoint and it’s the same with this one. It’s quite impressive to have a game that has voice acting for about 90% of the spoken dialogue on Nintendo’s handheld, which is still a very uncommon feat, even now. Sadly, the original Japanese voice acting makes way for an English cast, but a rather good one. Dialogues have a lot of emotion in them, whilst not treading in the waters of overacting. Certainly a great English rendition of the original game, and truth be told we simply loved our digital guide Tico-Tico (We chose the female guide. Sorry girls!). Tico-Tico is like a high school girl, especially the way she speaks, which makes things like totally awesome, ya dig? No, really, this adds a certain lightness to the events occurring all around you, making things seem a tad more manageable. Everything is supported by a nice soundtrack that becomes upbeat during hectic situations, while turning into soothing melodies when the time calls for it. Of course, some lighter tunes can be heard, that accompany many of the more witty dialogues and situations in the game. Shin Megami Tensei: Devil Suvivor 2 Record Breaker is a tactical RPG, that at certain times feels a bit like an elaborate Pokémon game, with an equally elaborate plot tied to it. You’ll be wading through many story sequences, to save Japan and perhaps even the rest of the world, by eventually battling demons with your own collection of demonic servants. You’ll have to wade through the game in a limited amount of ingame time, namely seven days for the first part and five for the last. Right after your first encounter with death, from which you barely escape, you will gain the allegiance of the lesser demons you had to beat. From here on out, you’ll start forming small teams, where you can always team up every character with two demons (max 4 teams). Unlike games such as Pokémon, you can’t capture demons that are roaming around, but by defeating those uncontrolled demonic enemies, you’ll be able to purchase most of them from the Demon Auction House, at least if your level is high enough and excluding rare demons of course. The auction will allow you to pick up certain demon types at a rather cheap price and if you’re a regular customer, they will even throw in some special auctions as well. If you wish to find more demons you haven’t encountered yet, you’ll have to fuse the demons in your possession together. You’ll have a hefty amount of combinations, and you’ll be able to add a few of the traits of both original specimens to your newly created monster. You’ll have to spend some time matching demons in order to get combinations you like, or finding out which add very powerful monsters to your collection. This will be something you’ll spend a lot of time on, as you’ll regularly need new and more powerful demons, as your demons themselves often level too slow to stay relevant for longer periods of time. Later on in the game, you’ll unlock the compendium, which can be used to look up stats about demons that have been in your possession, and you can resummon those demons, albeit at a rather expensive price. Combat consists out of two phases, namely the movement of your teams, which is done in a gridded environment, where you can move, when it’s your turn, and already cast several spells which can serve your team(s) or obstruct the enemy team(s). After that it’s a matter of “attack or be attacked” (or escape when needed). During the actual combat phase it’s pretty much the same formula as in many other old school RPG games, where each character will get their turn to perform an attack or execute a skill. Nonetheless, a fun mechanic is thrown into the mix, where you or your opponent can score extra turns by exploiting the weakness of your target, or by equipping certain skills that help you with this. Of course, skills that remove extra turns are also present, thus it will be a matter of great planning, as well as luck. Skills are quite special in this game, at least for the actual characters (team leaders) and not the demons. You’ll have to learn new skills by using the skill crack function, which is pretty much a mechanic where you’ll have to indicate which team will beat which opponent, in order to steal one of the opposing demon’s skills. That being said, you’ll have a hefty amount of skills to steal over the course of your playthrough, BUT each skill can only be equipped once, thus you’ll have to choose carefully which character gets which skills. Of course, when beating demons, at the end of each battle you’ll acquire experience, which will allow you to level up. Your team members, or simply the protagonists of the story, will choose which stat they pick when leveling up, whilst you are able to choose which direction you wish to head with your own character. You’ll be able to choose one stat every level up, namely strength, magic, vitality or agility, respectively representing physical power, spell power and MP, total amount of HP and speed and chance of acquiring extra turns. Seeing the game relies heavily on the story, you’ll have a lot of story events to choose from, over the course of the limited time you have in the game. Each event will always take you thirty minutes and often you’ll have ample choice, thus you’ll have to choose which path you will have to follow and which characters you spend the most time with, as bonds are very important in the game. When increasing bonds with characters, you’ll earn extra stats, new fusion ‘recipes’ and you are allowed to use skill crack more loosely, namely the character will also allow your character to skill crack the skill for him/her. 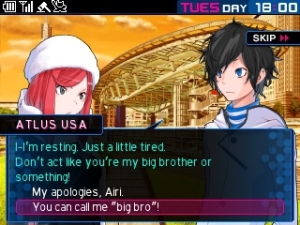 Shin Megami Tensei: Devil Survivor 2 Record Breaker proves that this gem of a game is still relevant on Nintendo’s current handheld. The extra content is pretty much the equivalent of an extra game thrown into the mix and the fusion system has a certain Pokémon vibe to it, which is time consuming, but in a good way. Everything is accompanied by a great story, where character development is rather important. Overall, if you’re looking for a game to take with you in your back pocket that’s really worth it, then look no further. Even though Halloween has already passed, these demons should not be overlooked.